Morgan’s Wonderland is the world’s first ultra accessible family fun park designed specifically for children and adults with special needs, their family members, caregivers, friends and the entire community. At the entrance of the park stands “Taking Flight” a 25-foot-tall cast-bronze sculpture, which took 800 pounds of clay, 1,500 pounds of steel and 6,200 pounds of bronze to create. It is the largest cast bronze sculpture in San Antonio. 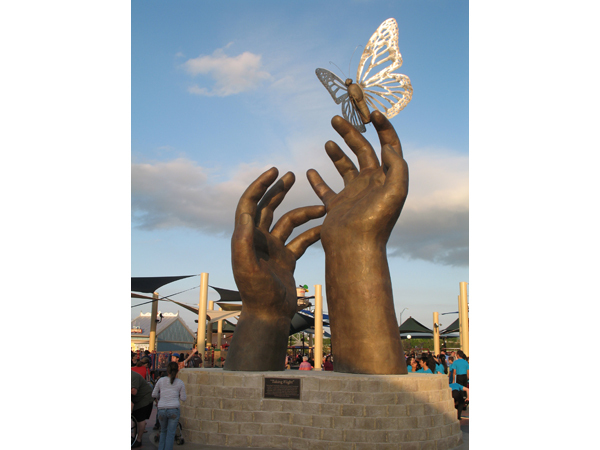 The sculpture of a butterfly ready to take flight from a child’s outstretched hands reflects “what the theme of this park is all about, which is butterflies – the idea being that children and adults who come here are able to get out of their cocoons and fly and do things that before they couldn’t do,” said Gordon Hartman, founder of The Gordon Hartman Family Foundation. The foundation is dedicated to transforming the lives of those with special needs, through investing financial support, time and themselves into organizations that serve individuals with cognitive and physical disabilities.